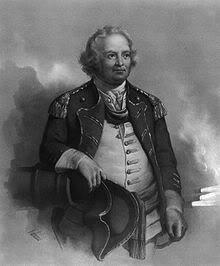 Israel Putnam was born on January 7, 1718 in Salem, Essex County, Massachusetts, to Joseph Putnam and Elizabeth Porter Putnam. He was not interested in education but loved being physically active and adventurous, and had a reputation for courage and competitiveness as a young man. At age 20, Putnam married Hannah Pope, and shortly thereafter the couple moved to Connecticut, where he and his brother-in-law together bought 514 acres. Within two years he was able to buy out his partner and thus became sole owner in what was called the Putnam Farm, on the top of the high hill between the villages of Pomfret and Brooklyn. Although Massachusetts born, the best days of his life were spent in his adopted state. For many years Israel Putnam devoted himself to the cultivation of this farm, and it was considered one of the finest in New England. He gave special attention to raising sheep and fruits, especially winter apples. During the French and Indian War, Putnam excelled in guerilla tactics, fighting with the Connecticut militia in a special unit known as Roger’s Rangers. 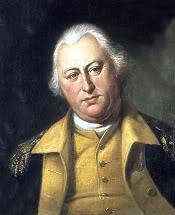 He quickly proved his talents as a skilled warrior and was promoted to captain in 1755 and then to major in 1758. With fifteen honorable combat wounds marking his body and memories of many hair-raising adventures, the legend came home to Pomfret in 1765, hoping to find peace in farming the familiar acres, getting to know his eight children and socializing with old friends. Shortly after his return, one of his ten children and his wife Hannah died. Putnam’s leadership was again summoned in 1764 during Pontiac’s Rebellion when he was appointed Commander of five militia battalions. He was soon married Deborah Gardiner, a wealthy and socially prominent widow whom he had known for years, and he managed to spend a relatively quiet ten years, farming and devoting himself to the local offices to which his fellow townspeople elected him. 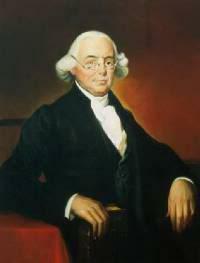 Putnam was outspoken against British taxation policies and around the time of the Stamp Act crisis in 1766, he was elected to the Connecticut General Assembly, served as chairman of its committee of correspondence, and was one of the founders of the Connecticut Sons of Liberty. By the eve of the Revolution Israel Putnam had become a relatively prosperous farmer and tavern keeper, with more than a local reputation for his previous exploits. Increasing animosity between the hard-working colonials, who had built their new communities with their own blood sweat and tears, and their British overseers, who were taxing the colonies ever more heavily to finance affairs at home, finally exploded with the shot heard ’round the world on April 19, 1775, at Lexington, Massachusetts. On the morning of April 20, 1775, Putnam and his son Daniel had gone into the field near the tavern at Brooklyn Green to plow. They were busy at work when about eight o’clock a messenger rode into the village, announcing that the British had fired on the militia at Lexington, Massachusetts, had “killed six men and wounded four others,” and were on their march into the country. Elizabeth Schuyler (Eliza Hamilton, Elizabeth Schuyler Hamilton) was born on August 9, 1757, in Albany, New York. She was the second daughter of Revoluntionary War General Philip Schuyler and Catherine Van Rensselaer Schuyler, one of the richest and most political families in the state of New York. Schooled at home, Elizabeth grew up mostly at her father’s grand new mansion in Albany and at their summer home at Old Saratoga. Alexander Hamilton was born a British subject on the island of Nevis, West Indies, on January 11, 1755. His mother, Rachel Fawcett Levine, was jailed in 1745 for “adultery and whoring with everyone.” Her husband’s divorce petition in 1759 declared she was the mother of two illegitimate children, one of whom was Alexander Hamilton. He carried the name of James Hamilton, a Scottish immigrant who may have been his father. He and Rachel certainly lived together. By the time she died, they were separated. Alexander was sent to live with Rachel’s family. The boy of twelve was put out to work as a clerk, but was soon longing for bigger things. Alexander’s superior intelligence was easily apparent to local patrons on Nevis Island, including his cousin, Ann Lytton Mitchell, who saw to it that Alexander was educated in America. He arrived in New York in 1772 and began classes at Elizabethtown Academy in New Jersey in the autumn of 1772 to prepare for college. Hamilton’s connections in Elizabethtown, New Jersey, were good ones. He boarded with the well-to-do lawyer William Livingston and his wife Susannah French Livingston. Elias Boudinot, another leading citizen, is believed to have helped Hamilton financially. Both Livingston and Boudinot were trustees of the College of New Jersey (now Princeton), but Hamilton’s application there was rejected. He was accepted at Kings College in New York City (now Columbia), and entered school there in the spring of 1774. Hamilton had no sooner settled in college when he became involved in revolutionary politics. In December 1774, he published his first revolutionary pamphlets, A Full Vindication of the Measures of Congress, followed by another in February 1775. He believed that a principal purpose of government was to protect property. He believed the common man needed governing in the direction of the common good, because his natural interest is self-interest. This worldview, set down and published when he was 20 years old, continued unchanged until his death. Hamilton began drilling with a military company in St. Paul’s churchyard, and in August 1775 was part of an action to remove British cannons from a fort at the Battery that was under fire by British warships. He left Kings College without graduating, and in March 1776 was made captain in New York’s provincial artillery. Edmund Jenings Randolph was born August 10, 1753, to the influential Randolph family at Tazewell Hall in Williamsburg, Virginia. His parents were Ariana Jenings and John Randolph. They owned tobacco plantations worked by slaves. Edmund and Elizabeth were born less than 24 hours apart. Edmund was educated at the College of William and Mary. After graduation he began studying law with his father and his uncle, Peyton Randolph. When the American Revolution began, father and son followed very different paths. John Randolph, a Loyalist, who continued to support the British, followed royal governor Lord Dunmore to England in 1775, taking his wife and daughters, but leaving his son. Edmund was very much in support of the revolutionary fervor that was developing in Virginia and throughout the colonies. While his family were crossing the Atlantic, Edmund was joining the Continental Army as an aide-de-camp to General Washington. Edmund was sensitive about his family’s honor; because his father had remained a Tory, Edmund felt it his duty to erase the stain on the Randolph name. He moved in with his uncle Peyton Randolph, a prominent figure in Virginia politics. In October 1775, after Peyton Randolph’s sudden death, Edmund returned to Williamsburg to act as executor of his uncle’s estate. Edmund inherited a large part of Peyton Randolph’s personal property through his will. Edmund was elected as a representative to the Virginia Convention while attending to those duties. That convention adopted Virginia’s first state constitution in 1776. Edmund was the convention’s youngest member at age 23. He soon became Mayor of Williamsburg and then the State of Virginia’s first Attorney General. Edmund Randolph married Elizabeth Nicholas on August 29, 1776, and they had six children, including son Peyton Randolph (named for his uncle), who was Governor of Virginia from 1811 to 1812. Elizabeth raised their children and supported her husband through all his years of public service. Thomas Paine was born on January 29, 1737, in Thetford, England. His father, Joseph, was a poor Quaker corset maker who tried to provide his son with an education at the local grammar school, but eventually was forced to apprentice him to his trade. Paine was unable to accept this occupation. For the next 24 years, he failed or was unhappy in every job he tried. He went to sea at 19, lived in a variety of places, and was for a time a corset maker like his father, then a tobacconist, grocer, and teacher. On September 27, 1759, Thomas Paine married Mary Lambert. His business collapsed soon after. Mary became pregnant, and she went into early labor, during which she and their child died. He married again in 1771, but was legally separated from his second wife in 1774, just as he was about to sail for the American Colonies. His job as tax collector in 1762 was lost in 1765 because of an improper entry in his reports. Reinstated a year later, Paine combined his duties as excise officer with managing a small shop from 1768 until 1774. He was dismissed again in 1774, probably because he wrote a petition to Parliament for higher salaries for excisemen. In 1774, by happenstance, Paine met Benjamin Franklin in London, who helped him emigrate to America, where he landed on November 30, 1774. On arriving in Philadelphia, he sensed the rise of tension and the spirit of rebellion that had steadily mounted in the Colonies over the last several years. Paine soon began a new career as a journalist. He contributed articles to the Pennsylvania Magazine on a wide range of topics. He first published his African Slavery in America in the spring of 1775, criticizing slavery in America as being unjust and inhumane. On January 10, 1776, Thomas Paine published a short pamphlet, Common Sense, which immediately established his reputation as a revolutionary propagandist. 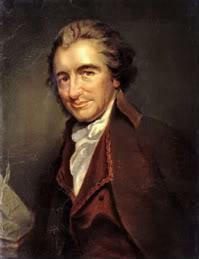 Although he had only been in America less than a year, Paine committed himself to the cause of American independence. In Paine’s view, the Colonies had every right to revolt against a government that imposed taxes on them, but would not give them representation in Parliament. In writing the pamphlet, Paine was encouraged by the Philadelphia physician and patriot Benjamin Rush. Rush read the manuscript, got Benjamin Franklin’s comments, suggested the title, and arranged for anonymous publication by Robert Bell of Philadelphia. Common Sense advocated America’s complete independence of Britain. It followed the natural rights tenets of the British philosopher John Locke, whose writings had justified independence as the will of the people and revolution as a device for bringing happiness. Although the arguments were not original, Paine’s passionate language and direct appeal to the people prepared them for the ideas expressed in the Declaration of Independence. 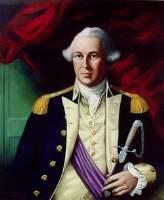 Joseph Warren was born in Roxbury, Massachusetts, on June 11, 1741. After attending the Roxbury Latin School, he went to Harvard College, graduating in 1759, and then taught for about a year at Roxbury Latin. He studied medicine with James Lloyd and opened his own practice in 1764, and he quickly became the most prominent doctor in Boston. Warren clearly demonstrated that he recognized and accepted his civic role in his work in public clinics, conducting smallpox vaccinations and treating its victims in Boston. He remained in Boston during the 1763 smallpox epidemic, administering to the ill, and opened an inoculation hospital at Castle William in Boston Harbor. The success of the inoculations in reducing deaths established Dr. Warren’s reputation in Boston, and his practice expanded from the poor end of Boston to include the wealthy and influential. On September 6, 1764, Joseph Warren married Elizabeth Hooton, an 18-year-old heiress. They would have five children, four of whom survived: Elizabeth, Joseph, Mary, and Richard. While practicing medicine, Warren met both the Boston aristocracy and the radical colonial leaders who would shape his future path and define his sense of purpose as a political figure. His patients included both future Whig leaders such as John Adams and Tories such as Thomas Hutchinson, the Colony’s lieutenant governor. Warren became involved in politics, and developed a close relationship with patriots John Hancock, Samuel Adams and Paul Revere, and was one of the original members of the patriotic organization known as the Sons of Liberty. After the Boston Massacre in 1770, Warren was at every town meeting, arguing for the rights of the American Colonies. Mary Cushing was born in 1730, the daughter of Elijah Cushing and Elizabeth Barker Cushing of Pembroke, Massachusetts, whose ancestors were among the founders of Hingham, Massachusetts. Benjamin Lincoln was born on January 24, 1733, the son of Colonel Benjamin Lincoln (1699-1771) and Elizabeth Thaxter Norton Lincoln also of Hingham, MA. He spent his early life working on the family farm, and attended the local school. A prominent farmer, Benjamin’s father was a Colonel and served on the Governor’s Council as well as in the Massachusetts House of Representatives. His father’s wealth allowed him to accept responsibilities at an earlier age than most of his contemporaries. At 21 in 1754, he became town constable, a combination policeman and tax-collector. Lincoln gained his first military experience in the French and Indian War, which began in 1754 and ended in 1763. As an established farmer and family man, he did not volunteer to take part in the fighting, but was involved in recruitment, training, and supplying his father’s regiment, the Third Suffolk. By the end of the war, Lincoln had reached the rank of Major. On January 15, 1756, Benjamin Lincoln married Mary Cushing. They had eleven children. In 1757, Lincoln was elected town clerk of Hingham, an office which both his father and grandfather had held before him, and which Lincoln would hold for twenty years. This post helped make him one of the town’s leaders by the age of twenty-five. In 1762, he was appointed Justice of the Peace. Immediately after the French and Indian War, the protests against Great Britain that would eventually lead to revolution began. Lincoln’s father was still on the Governor’s Council, where he was a political moderate and disliked the new radical atmosphere, but his position on the Council became increasingly difficult as Massachusetts polarized. Hingham’s politics were in step with the increasingly revolutionary tone of the state, but remained more moderate than the radical Bostonians. Lincoln remained in the background while his father was still active, but after his father retired from the Council in 1769, Lincoln was free to follow his own more radical inclinations. In 1770, in a list of resolutions passed by the inhabitants of Hingham, Benjamin Lincoln outlined the measures urged by Hingham residents towards the non-importation of British goods and condemned the Boston Massacre, during which several Patriots were killed. Lincoln’s father died in 1771, leaving Benjamin the head of the family and increasing his prominence in Hingham. The following year, he was elected to the Massachusetts General Court. Lincoln, like many others, believed that the British wanted to suppress American liberty. Lincoln rose to the rank of lieutenant colonel in the Suffolk Militia in 1772, which allowed him to gain military experience that he would use in three major battles of the Revolutionary War. As the Revolution approached, he took a stronger Whig position than most of the other leading inhabitants of Hingham, and he came to a wider prominence towards the end of 1774. The new royal governor, British General Thomas Gage, ordered the election of a new General Court. Lincoln was elected to the court in September 1774. However, Gage quickly dissolved it when it became clear that its members were not going to cooperate with him. Rather than return home, the members of the General Court declared themselves a Provincial Congress, which met three times over the next nine months, at Concord, Cambridge, and Watertown, Massachusetts. Lincoln was appointed secretary of the Congress, and he worked to replace officials appointed by the Royal governor and council with reliable Whigs (Patriots). The Congress dedicated itself to gathering military supplies and finding safe places to store the arms. Lincoln was not directly involved in the fighting at Lexington and Concord on April 19, 1775. In the immediate aftermath, the local militia regiments rushed towards Boston. The Provincial Congress also reacted quickly, re-convening on April 22. Once again, Lincoln was appointed to a key post as muster master of militia, and as a member of the Committees of Safety, Supply, and Governmental Organization. Copley posed Dorothy with a hand to her face in a thoughtful pose. 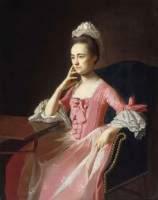 Her silk pink robe and matching stomacher are decorated by a large bow, and the sleeves end in triple ruffles. Her sheer apron is embroidered with large floral sprays. Her hair was probably combed over a roll, and atop this hairdo she wore a dress cap of lace, gauze and ribbon. Dorothy Quincy, born in Boston on May 10, 1747, was the youngest of ten children of Judge Edmund Quincy and Elizabeth Wendell Quincy. 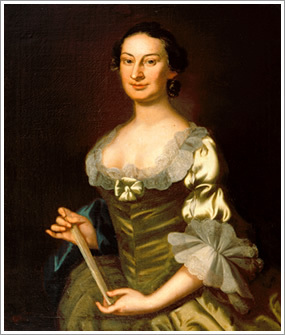 Dorothy spent most of her early years in Braintree, Massachusetts, in a lively household, where John and Samuel Adams, Dr. Joseph Warren, James Otis, and John Hancock frequently visited her father, an ardent patriot. Dorothy was raised at the Quincy Homestead in what is now Quincy, Massachusetts. Dorothy’s mother was Elizabeth Wendell, daughter of Abraham and Katharine DeKay Wendell of New York, an educated and accomplished woman of high character, with a taste for social life and a liking for the society of young people. Therefore, the Quincy household, with its bevy of handsome girls, had many visitors. After she entered her teens, Dorothy Quincy must have heard alot about patriotism. John Hancock was born on January 23, 1737, at Braintree, Massachusetts, in a part of town which eventually became the separate city of Quincy. He was the son of a Congregational pastor, and as a young child, Hancock lived a comfortable life. Thomas Hancock owned a firm known as the House of Hancock, which imported manufactured goods from Britain and exported rum, whale oil and fish. His highly successful business made him one of Boston’s richest and best-known residents. The couple became the dominant influence on John’s life. John was sent to Boston Latin School, then for a business education at Harvard College, where he graduated at the age of seventeen. He then went on to apprentice in Uncle Thomas’ commercial empire, and greatly pleased the old gentleman by his intelligence and attention to his duties. John learned much about his uncle’s shipping business during these years, and was trained for eventual partnership in the firm. Hancock worked hard, but he also enjoyed playing the role of a wealthy aristocrat, and developed a fondness for expensive clothes. In 1760, John went to England for a year while building relationships with customers and suppliers. Here he had a chance to supplement his education with travel and acquaintance with men of affairs. He listened to the debates of Parliament, witnessed the funeral of George II and the coronation of George III, and picked up a good general knowledge of the English people and their way of thinking. Mary White was born in 1749. Her parents, Colonel Thomas and Esther White, were described by one historian as “people of the highest character,” who were much respected and socially important members of the Philadelphia community. Her father came to this country from London in early life and settled on the eastern shore of Maryland. After his first wife died, he moved to Philadelphia, and married a widow named Newman. With her he had two children: Mary and her brother William. Robert Morris was born on January 20, 1734, to Robert Morris, Sr. and Elizebeth Murphet in Liverpool, England. At the age of thirteen, Robert moved to Oxford, Maryland, on the eastern shores of the Chesapeake Bay, where his father was a tobacco factor. The younger Morris was provided a tutor, but he quickly learned everything they had to teach. His father arranged for Robert to go to Philadelphia, where he stayed with Charles Greenway, a family friend, who arranged for young Robert to become an apprentice to the shipping and banking firm of Philadelphia merchant, Charles Willing. A year later, Robert’s father died after being wounded by the wadding of a ship’s gun that was being fired in his honor, and he was left an orphan at the age of fifteen. After Willing’s death in 1752, the 18-year-old Morris became the partner of Charles’s son, Thomas Willing. On May 1, 1757, they established the prominent shipping-banking firm of Willing & Morris, which lasted until 1779, and they often collaborated thereafter. Eventually they sent ships to India, China, and the Levant, and the firm’s business of import, export and general agency made it one of the most prosperous in Pennsylvania. As a result, Morris became both wealthy and influential in Philadelphia. The Stamp Act of 1765 was a tax on all legal documents, yet the lawyers did not act to oppose it. However, the merchants banded together to end what they saw as an unconstitutional tax. Morris began his public career by serving on a local committee of merchants organized to protest the Stamp Act. He mediated between a mass meeting of protesters and the Stamp Tax collector, whose house they threatened to pull down “brick by brick” unless the collector promised not to execute his job. Morris remained loyal to Britain, but he believed that the new laws constituted taxation without representation and violated the colonists’ rights as British citizens. In the end, the stamp tax was lifted. Julia Stockton was born March 2, 1759, at Morven, the family estate near Princeton, New Jersey. She was the eldest daughter of signer Richard Stockton and poet Annis Boudinot Stockton. Julia received as liberal an education as was open to women of her day, supplemented by her association with the cultivated people whom her father and mother gathered in their home. The daughter of a lawyer and trustee of the College of New Jersey, Julia grew up in a home where her father’s library was reputed to be among the best in the colonies. Painted by Charles Willson Peale in 1776, around the time of her marriage, the portrait depicts a serene and intelligent woman relaxing while playing her elegant English guitar with her books beside her. Both Julia’s father, Richard Stockton, and husband, Dr. Benjamin Rush, were members of the Continental Congress and signers of the Declaration of Independence. Benjamin Rush was born on December 24, 1745, to John Rush and Susanna Hall Rush in the Township of Byberry, about fourteen miles outside Philadelphia. His father died when he was six, leaving his mother Susanna the sole support of the family. She opened a grocery; was so successful that she soon opened another shop selling chinaware. At the age of nine, Benjamin was sent to Nottingham Academy in Maryland, which was run by his maternal uncle, the Reverend Samuel Finley. In 1760, he completed the five-year program at the College of New Jersey (now Princeton University), earning a Bachelor of Arts degree. Rush then studied medicine under Dr. John Redman in Philadelphia for six years. Redman encouraged Rush to further his studies at the University of Edinburgh, where he earned a Doctor of Medicine degree in 1768. While in Edinburgh, he helped his friend Richard Stockton convince Dr. John Witherspoon to accept the presidency of the College of New Jersey. Rush attended lectures in England and in Paris, where he enjoyed the friendship of Benjamin Franklin, who advanced money to pay Rush’s expenses. In August 1769, at the age of 24, Rush returned to America, opened a medical practice in Philadelphia, and became the most famous American physician and medical teacher of his generation. He also was appointed Professor of Chemistry at the College of Philadelphia. Dr. Rush practiced medicine extensively among the poor. His practice was successful; his classes at the university were popular. He began to engage in writing that would prove to be of considerable importance to the emerging nation. He also published the first American textbook on Chemistry. In 1773, Rush contributed editorial essays to the papers about the Patriot cause. He was active in the Sons of Liberty in Philadelphia during that time. He suggested the title, Common Sense, to his friend Thomas Paine for a pamphlet that became popular among patriots. 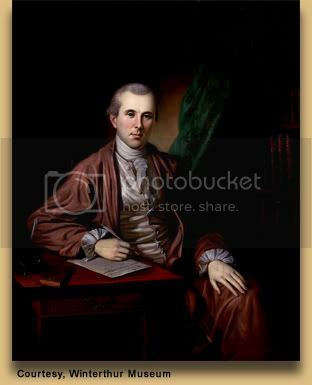 On January 11, 1776, Dr. Benjamin Rush married Julia Stockton, the 17 year old daughter of his good friend Richard Stockton of Princeton. The minister who married them was Dr. John Witherspoon, whom he had helped bring to America ten years earlier. Six months later, all three men would sign the Declaration of Independence. Rachael Bird was born in 1750, the youngest daughter of William Bird of Bucks County, Pennsylvania, proprietor of the fine country seat and iron works on the Schuylkill River, known as Birdsborough. Through her mother, Brigetta Huling Bird, Rachel was a descendant of the Marquis Jean Paul Frederick de Hulingues, a Huguenot nobleman attached to the court of Henry of Navarre. Rachel’s brother, Mark Bird, married Mary Ross, the sister of George Ross, a future signer of the Declaration of Independence. James Wilson was born on September 14, 1742, in Carskerdo, Scotland, the son of William Wilson and Aleson Lansdale Wilson. His father was a respectable farmer, living a healthy life but a hard one. Methods of husbandry were crude, there was little variety of produce, even fertile soil was not constituted to yield lavish crops, and after the rent had been met there could be but little to lay by. Dwellings were small and bare, plenishings were meager and rude. Nevertheless, a boy with intelligence and grit could find opportunity to furnish his mind and train his faculties. At the age of 15, James earned a scholarship to the United College of St. Salvator and St. Leonard at the University of St. Andrews. While his studies there were centered primarily on preparing him for a life in the church, later writings reveal that he entertained much broader interests, including classical governments and philosophy. He received a degree from St. Andrews in 1762. Wilson then studied briefly at the Universities of Edinburgh and Glasgow. He attended a surprising number of schools, and never attained a degree. In 1765, Wilson embarked upon his journey across the Atlantic. He arrived in New York in the midst of the controversy over the Stamp Act, which levied a tax on all documents involved in the internal commerce and business of the colonies. Moving to Philadelphia, Wilson taught Latin at the College of Philadelphia, a school only recently founded with the help of Benjamin Franklin, and which was to become the University of Pennsylvania. The trustees there were impressed with his classical scholarship and the all-around quality of his educational attainments. After only a few months, Wilson found an opening as a student of the law in the office of John Dickinson, a leading lawyer and politician who would later play an important part in opposing the Declaration of Independence. Applying himself wholeheartedly to the study of law, Wilson was admitted to the Pennsylvania Bar in 1767. In 1768, the year after his admission to the Philadelphia bar, Wilson set up practice at Reading, Pennsylvania. He also found time to lecture on English Literature at the College of Philadelphia, which had awarded him an honorary master of arts degree in 1766. On borrowed capital, Wilson also began to speculate in land, which became a life-long fascination. He had bought a small farm near Carlisle, and dabbled in land speculation in New York and Pennsylvania.